Zhao Yun can use Attack and Escape cards interchangeably. Whenever Zhao Yun uses "Dragon Courage," he can immediately take a hand card from the target. "Dragon Courage" is identical to the original non-SP Zhao Yun's ability. The 'target' in "Rush Formation" can refers to the character that caused SP Zhao Yun to play the Attack/Escape or the player who is targeted by an Attack/Escape. 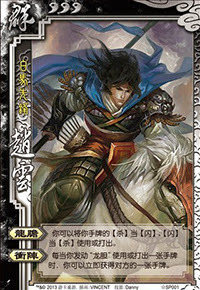 For example, if SP Zhao Yun targets an enemy with an Escape that was played as an Attack via "Dragon Courage," he takes a hand card from the target. If an enemy Attacks SP Zhao Yun and he uses an Attack as an Escape, he can take a hand card from the Attacker. This ability also works when SP Zhao Yun uses "Dragon Courage" in response to Barbarians, Hail of Arrows, and Duel. 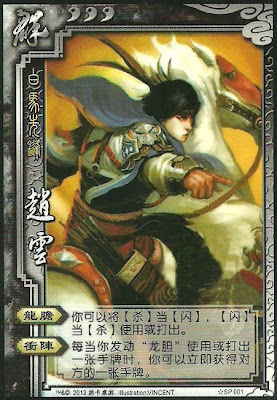 When SP Zhao Yun activates "Rush Formation," he takes a hand card before his action goes into effect. For example, if SP Zhao Yun uses "Rush Formation" to Attack an enemy with an Escape, he takes a hand card from the enemy before they have a chance to play an Escape. Between "Dragon Courage" and "Rush Formation," SP Zhao Yun is incredibly powerful offensively and defensively. Unlike the original Zhao Yun, there is a penalty for other players if they try to hurt SP Zhao Yun and fail. This can act as a very powerful deterrent. "Dragon Courage" and "Rush Formation" have a tendency to self-perpetuate as other players will be likely to keep Attack and Escape cards in their hands. The only ways to attempt to damage SP Zhao Yun without risking losing hand cards is to use a character ability or try to damage him with Blaze. As a result, most players will stall when confronted with him and slowly wither away into nothing as SP Zhao Yun Attacks them. If SP Zhao Yun has no Attacks/Escapes, his enemies will take note of this and finish him off quickly, as he is a very high-profile character. SP Zhao Yun has little to offer when trying to help teammates. Liu Bei/Guo Jia/Xun Yu/Chen Gong - These characters can give SP Zhao Yun Attacks and/or Escapes so he can use his abilities more effectively. Xun You - Xun You is one of the few reliable counters to SP Zhao Yun. His "Element of Surprise" leaves him with no hand cards for SP Zhao Yun to take in response to his Hail of Arrows or Barbarians. 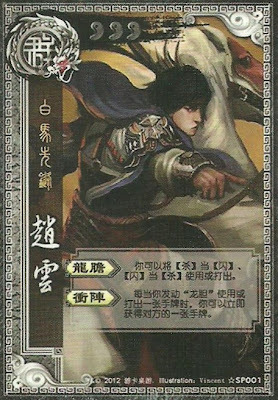 Also, his "Wisdom and Foolishness" will cost SP Zhao Yun a card if he chooses to hurt him outside of his turn when he has no hand cards. Zhang Liao/Zhang He/Gan Ning/Lu Su - These characters can cause some problems for SP Zhao Yun if they focus their card destruction techniques on him. Dian Wei/Younger Zhuge Liang/Ling Tong/Zhang Jiao - These characters can cause problems for SP Zhao Yun because they have abilities that can deal direct damage that cannot be prevented with the use of an Attack or Escape. Huang Zhong/Ma Chao - These characters have abilities that can make prevent SP Zhao Yun from using Escapes on their Attacks. King SP Zhao Yun is a very powerful king choice. The rebels will likely lose cards when trying to damage him and leave them weak to the loyalists and/or SP Zhao Yun himself. Loyalist SP Zhao Yun is a good loyalist. He can do a lot of damage to rebels. However, if the king becomes very weak, it is difficult for SP Zhao Yun to help them. Rebel SP Zhao Yun is a very strong rebel. He can weaken the king considerably with the use of his abilities. Spy SP Zhao Yun is a strong spy pick. None of the other characters will want to try to hurt him because they will put their own hand cards at risk. He is also powerful enough to turn the tide of the battle if one side gains an advantage. His only weakness in this role is that he may have more difficulty in protecting the king if he is about to die. There is no way around it - SP Zhao Yun is overpowered. The original Zhao Yun was weaker than most of the other characters and this SP version was made to improve him and make him more well-balanced with the other characters. However, they made him way too strong. More often than not, SP Zhao Yun's team wins. If you want to keep the game well balanced, do not put SP Zhao Yun in the deck. It is almost impossible to damage SP Zhao Yun consistently without putting hand cards at risk. Even if SP Zhao Yun has no Attacks/Escapes in his hand, he can easily bluff and most experienced players will not try to hurt him.